Eugene Laverty says he wants to end his World Superbike season on a high after a disappointing campaign on his Aprilia. "The season has not turned out as I expected, but we have learnt a lot of valuable lessons and I want to win a race before the season ends," said Laverty. "I have three rounds left, starting at Germany this weekend, and then one of my favourite tracks in Portugal still to come." 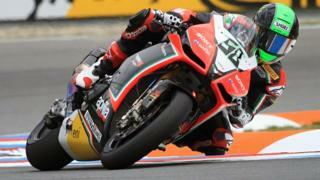 Laverty also indicates that he would liek to stay with the Aprilia team for next season.